the xray doctor: xrayoftheweek 44: what's wrong with this heart? xrayoftheweek 44: what's wrong with this heart? The #xrayoftheweek is this chest x-ray in a young woman with shortness of breath - what do you see and what is the leading cause of this worldwide? The x-ray shows signs of mitral valve disease - and the echocardiogram confirmed mitral stenosis. This leads to cardiomegaly. The left atrium enlarges and can sometimes cause a double right heart border as the edges of both the right and left atria are seem, although this is not so obvious in this particular case. 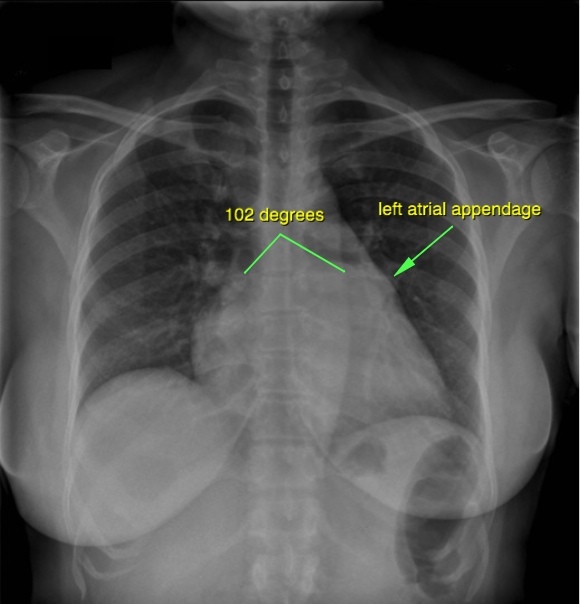 If this sign is seen, a measurement can be taken from the edge of the left atrium to the left main bronchus, and a measurement greater than 7 cm is a sign of left atrial enlargement. The carina is splayed as result of the enlarged left atrium pushing up from underneath, and the left main bronchus assumes a more horizontal position. Finally, the left atrial appendage enlarges, seen as a loss of normal concavity just inferior to the left pulmonary artery. There may also be signs of cardiac failure although not clearly seen in this case. The commonest cause of this globally is rheumatic heart disease in which an endocarditis leads to valvular stenosis. Watch this short video by Andrew Dixon of Radiopaedia and Radiology Channel which explains these signs of left atrial enlargement. Increased subcarinal angle to >90 degrees and loss of normal concavity below the left pulmonary artery due to left atrial appendage enlargement are signs of left atrial enlargement.